Some aesthetes and experts, with substantial knowledge of their domains have offered an uncluttered insight into their own areas. Thereafter, each performing art-scene is taken up and illustrations are offered so that the common art-lover and art-enthusiast can pick up enough acquaintance with the area of one’s interest and appreciate what is going around. Classical dances, for instance, are performed galore in their newfound strength and, side-by-side, new experiments are on: in keeping with new tastes and heterogeneous audiences. Classical music has found its firm foothold not withstanding plenty of innovative attempts and fusion efforts. Theatre has come of age: with both dramatic texts as well as performance practices that happily commingle today. The changing milieu of the arts and culture scene in India has been both breath - taking and fascinating since the country's Independence, given the new found awareness of the near- forgotten heritage and suddenly awakened faith of the people in their capability to surge forward. Taking only the performing arts - comprising dance, music, theatre, cinema and puppetry - the progress and transformation from the dozen or so well- structured courses in the University of Manchester, not easily available in this part of the world), I self the time was ripe to become a 'chronicler' of the passing scenario. Indian Performing Arts was my first book in 1992 covering substantially the area for the 1970's and 1980's. With an encouraging Foreword by the scholar-aesthete Dr. Kapila Vatsyayan and delightful sketches by the master-artist RK Laxman, the book (from Vikas Publishing House) was surprisingly well received - especially abroad - and went through multiple editions till the copies got exhausted. It was time to cover the secne in the 1990's and Indian performing Arts: A Mosaic has been an entirely new book in that direction: out in early 2006 (from Harman Publishing House) which has been already snapped up by the market. A 'chronicler', almost like an historian, never rests! The new millennium has dawned meanwhile and there is a new restlessness of creativity around and, for a change, I asked some like-minded critics and practitioners: with substantial prowess as well as passion in their given fields: to introduce their subjects. I am beholden to Leela Venkataraman to do so in dance; Meeta Pandit in music; Ram Gopal Bajaj in theatre; Shantanu Ganguly in Cinema; and Sampa Ghosh in puppetry: offering their own 'millennium insights' and thereby enriching the volume. Additionally, I have thought it fit to include profiles (or interviews) of some millennium personalities with brilliant intellects and carryon looking at some interwoven, twilight domains of art and culture, calling them a 'miscellany'. Two points have all along been kept in mind. One, the 'chronicling' should do some justice to the variegated background of the arts and the artists. Two, it is equally important to delve into the minds of the dancer-choreographers, singer-composers and directors, and obtain their view-points about their creative outputs and desist from passing sweeping overviews, as may be discreate. Like all 'chroniclers', I have sorted and sieved my material, and striven to be illustrative: rather than exhaustive. As the title suggests, they are meant to be 'glimpses' - textually as well as visually - and should serve to whet the appetite of the common man: as an art-lover and art-enthusiast: to pick up a general background and then go to the scholarly tome. I am happy to have received unstinted love and affection of the artists and art lovers whom I have interacted with, in writing this book. I am beholden to them, for providing me with photos from their personal collection. I am particularly thankful to Sampa Ghosh for supporting me with every possible help in preparing the manuscript. During the eventful journey from temple and court to proscenium, Indian classical dance has successfully negotiated between extremes, even when made to stand on its head. 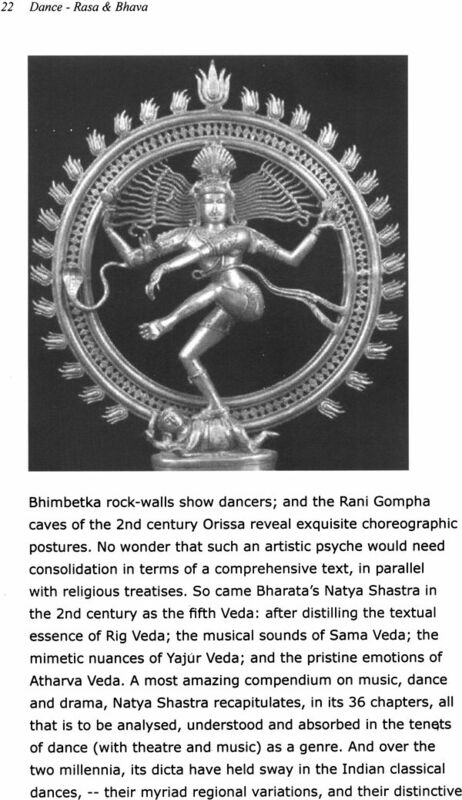 Recognition of dance as a source for human culture and also as a cultural perception of Self, representing the world view of a people, has in the challenges of finding legitimacy, opportunities and patronage in changed contexts, put its received legacy of idealistic principles to severe test. Dance as a preserve of traditional families, barring rare instances, is disappearing. More significantly in recent years, the vital link between art and patron, who in the past as connoisseur also shaped the art form defining its aesthetic frontiers, has snapped. Today's sponsor/patron is no specialist and between his unknowing populist demands and those of the art connoisseur, the classical dancer treads a delicate path. In the global context, dance as a player on the international stage, has long lost its cocooned privacy of being confined to its home. 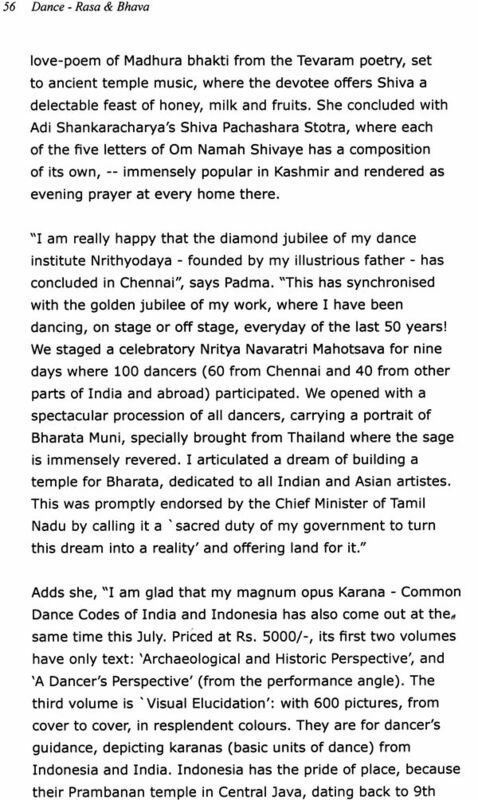 The Columbia University in Chicago in 2001 mounted an international Colloquium on Bharatanatyam in the Diaspora as a measure of how far our dances have traveled. 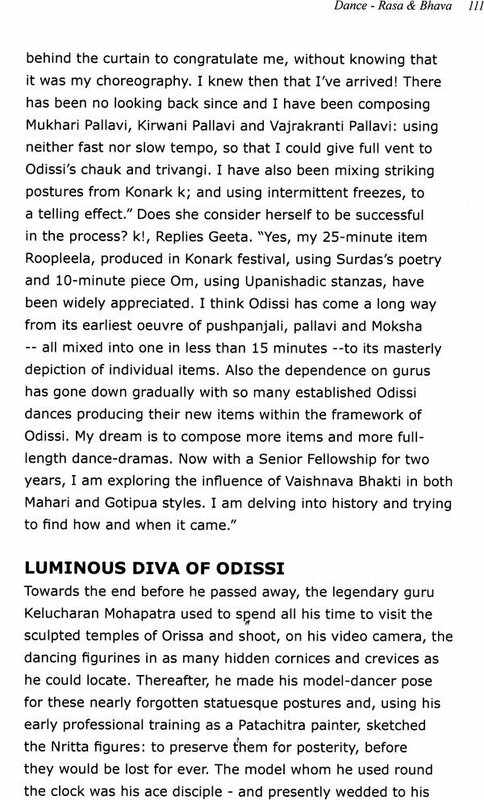 Odissi, reinvented only in the late 1950's till which time it was unknown beyond its home of Orissa, was the focus" of a massive three-day event combining seminar and workshops with performances, at Washington a couple of years ago! South Africa, till only the other day crushed under Apartheid and racism, today offers Indian dance as a Matriculation subject at the secondary school level. Bharatanatyam schools are mushrooming in Cape Town where Kathak and Kuchipudi are also well known. GIDA, an umbrella body of Indian dancers in Johannesburg, promotes not just Indian dance practice but also research. American universities have introduced Indian dance faculties, and in London, Bharatanatyam and Kathak have found significant space on the art scene. With burgeoning Indian Diaspora populations and increasing cultural exchange, most of our dancers have been treated to the any, which, way body movements of Modern Dance in the West and yet by and large have adhered to the crisply structured geometry of Indian dances -- their influences pertaining more to areas of spatial treatment and themes -- giving one some idea of the resilience of our dance forms. 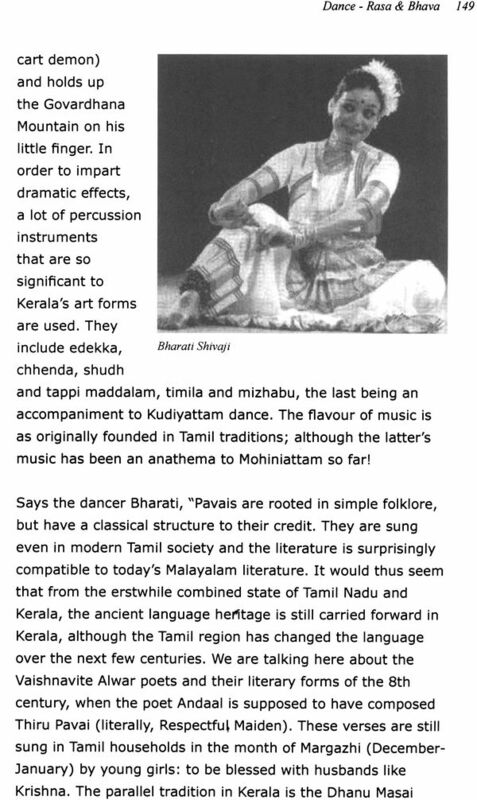 Despite uneven performance standards, there is, in serious dancers, an increased awareness of the Body in movement, evoked by Chandralekha's work This in a sense has strengthened the consciousness of stylistic profile, giving a new focus to central concerns like the triangle of the Bharatanatyam araimandi or the erect posture of the Kathak dancer. If dance was meant to consecrate temple space in the past, today it is performance space and the occasion, which can dictate and design the dance. Cosmopolitan audiences put a definite entertainment value on the dance - whether with or without appeal to the higher senses and the compulsion to communicate across cultures has often made today's dancer opt for spectacle with the rhythmic element played to the hilt. 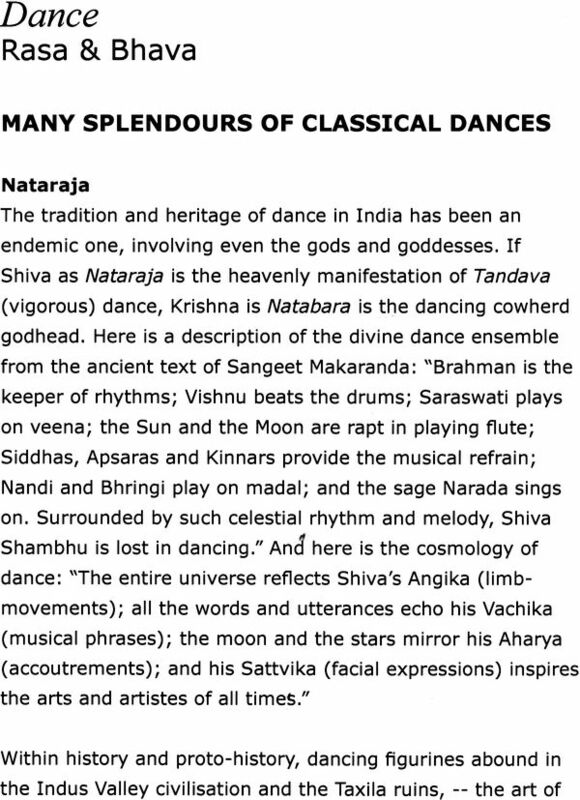 Bharatanatyam dances now revel in extended jatis and teermanams (rhythmic interludes of items like the varnam). So also is Kathak's emphasis on Peir ka Kaam (footwork) in a dance abounding in abstract rhythm-oriented bandishes (lyrics) with the interpretative side of the dance consigned to the hack burner. 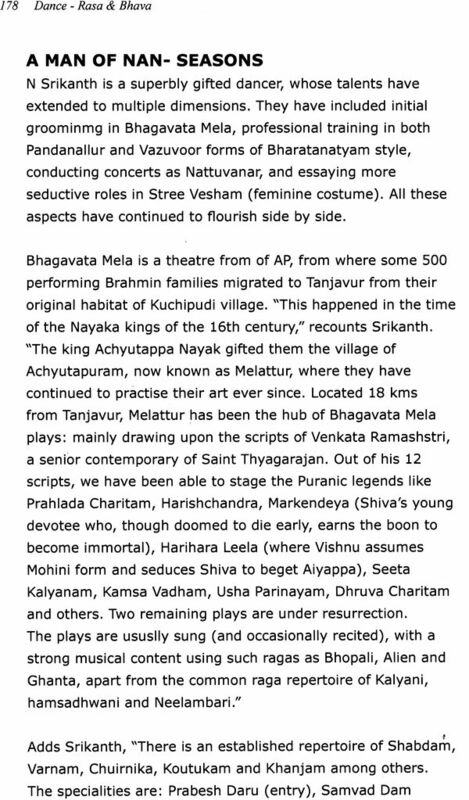 Large performance spaces play their part cutting out the performer/audience closeness required for the abhinaya focus, comprising as it does the gestural vocabulary and emoting face. Nuances-and delicate touches are lost on spectators seated beyond the first few rows. Instead, the interpretation of the musical text, calling for a degree of initiation in the audience for comprehending, takes a narrative form with episodic treatment. This kind of story telling by the solo dancer invests the performance with a theatrical quality communicating across audience levels. The diminishing thrust on the interpretative part goes hand in hand with an ever- lessening compulsion to absorb poetry or to inculcate the wider reading habit, providing a strong information base from which the creative faculty draws its ideas and imagery. Thus many technically qualified dancers of the present are ideationally poor. Even as the performance syndrome becomes more and more giddy, dance scholarship has few takers and seminars and symposiums on issues relating to the art form attract indifferent participation. 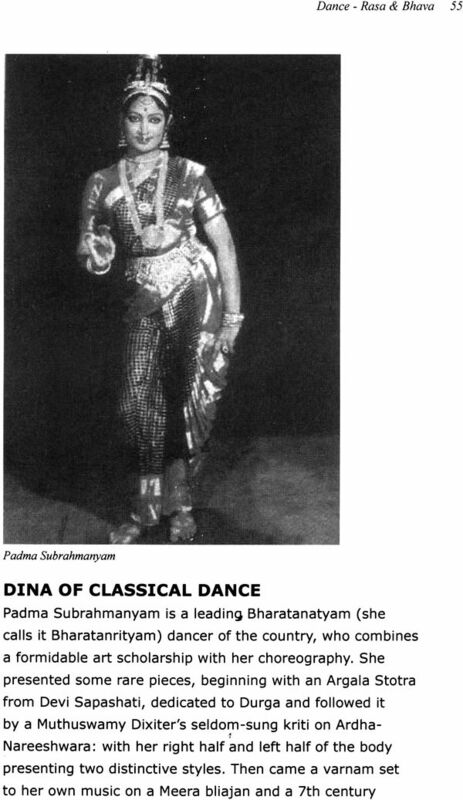 In the Silappadikaram seminar mounted by the India International Centre, the spotlight on one of the earliest texts with a plethora of dance references had just two dancers participating in the discussions. An evening at the Habitat mounted by Kri Foundation with American dancer of Kathak; Janaki Patrik speaking on methods by which she used her Kathak training in an American context (the talk supplemented with video clips), drew just a handful of Kathak practitioners. The old world abhinaya-based performances where mehfils thrilled to the dancer's interpretative nuances, in a Thumri, a Padam or a Javali are all but extinct and a veteran like Uma Sharma (who cannot boast of students in her line) will soon be an anachronism. Training in music as an integrated starting point of the dance journey, has also lessened. One experiences two distinct dance perceptions, one encased in an atmosphere f like that of Kalakshetra in Chennai, with the unshakeable faith that there is no dance or Bharatanatyam beyond Rukmini Devi's legacy and the other considerably smaller group convinced that the old margam repertoire as format for concerts is irrelevant in today's world. It is an upper crust of intelligent dancers among the second generation of talents like Priyadarshini Govind, Sharmila Biswas, Preeti Patel, Shovana, Prerana Shrimali, Geeta Chandran, Rama Vaidyanathan, Narendra and Mahalakshmi, Aditi Mangaldas, Daksha Sheth, who combine expertise in their respective dance genres, with an exploratory spirit which responds to contemporary sensibilities - thereby giving the prevailing dance scene, a vitality which prevails over a sea of mediocrity. The days of the solo dancer reigning supreme are meeting with some resistance. Prestigious performance spaces like Habitat World's HCL Concert Series, the India International performances; Chennai's major Season led by Krishna Gana Sabha's dance projection may all be strong champions of the solo form. But for sponsors, it is ensemble dancing with multiple, attractively-turned-out dancers going through movement, which may be just a collective version of what the solo dancer does, that provides visual variety for the largely uninitiated audience. Chandralekha's group work gave the lead, now avidly followed. During the last five to six years, Odissi dancers like Sharmila Biswas have created memorable group productions. 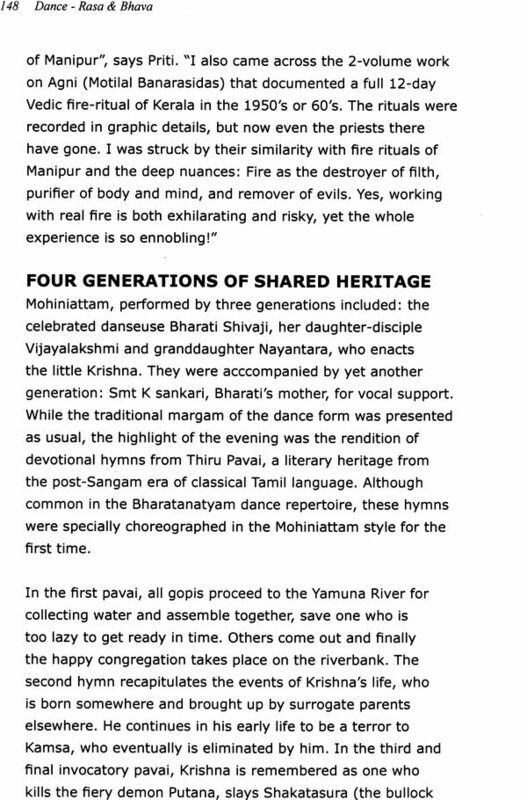 The Bangalore Nrityagram Ensemble has created new standards and perceptions of group work in Odissi in productions like Ganapati, Shakti based on the unique Chaushat Yogini temple complex, and even Pallavi compositions rendered in-group. 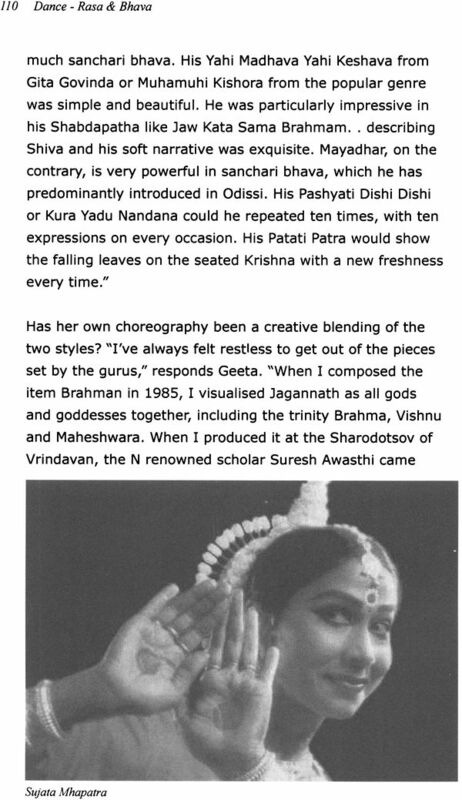 Leela Samson's Spanda provided a fresh perspective on ensemble work in Bharatanatyam. Bhanumathy, a senior Bharatanatyam dancer trained under Guru Dandayudhapani Pillai makes eye-catching, symmetry-oriented group arrangements with jatis and teermanams. Mohiniattam of late has interesting group work. With a commuting population of dance students and the constant mix-and-match atmosphere of the present, closely guarded Paramparas and traditional family inheritances as sharply defined trademarks are disappearing. Kathak's Gharana exclusivity, still jealously nurtured amongst a handful of surviving traditional inherif6rs, amidst the general run of performers trainej 'in both the Lucknow and the Jaipur gharanas, does 'riot go beyond naming which gharana the, band ish' piesented hails from - the' stylistic individualities dissolved in the overall regard for dance line. Even in Kathakali, where different schools nurtured patented' styles, the parampara borders have blurred with the Kalamandalam approach blending all styles. More than the non - classical contemporary dance movement, which in India has not received the encouragement it needs, nor grown the way hoped- for when the pioneer Uday Shankar created it, it is fresh versions of classical dance that have occupied' contemporary' space, according to modern dancers. Barring the lone figure of Narendra Sharma and his leadingstudents toiling to keep the contemporary dance flag flying high, others taking off from Uday Shankar have lacked the master's creative abilities.